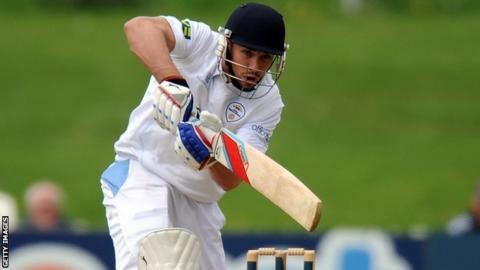 Derbyshire's Billy Godleman has been banned for two matches for throwing the ball in an "inappropriate and dangerous manner" during this week's match against Gloucestershire. Godleman, 26, was reported by the umpires during Derbyshire's seven-wicket win in their County Championship Division Two game at Bristol. He will miss matches against Glamorgan in Cardiff and at home to Northants. The left-hander hit 51 on the final day to help his side to victory. Godleman was given three disciplinary points last summer for an offence of "inappropriate and deliberate physical contact between players" following a clash with Leicestershire's Ben Raine. A second offence within 24 months carries six penalty points, taking Godleman's total to nine, triggering an immediate ban with no right of appeal. His suspension will last until 13 May.